Blackberry has a niche, and it’s not giving it up any time soon. If you want a phone with a keyboard, you’ll probably buy one of the TCL-built Blackberry devices like the new KEY2. However, that phone is pretty spendy at $650. If you don’t mind making a few sacrifices in your quest for a keyboard, Best Buy is having a KEYone fire sale. The KEYone launched at $549 in 2017, which wasn’t an unreasonable price. The phone has a Snapdragon 625, 3GB of RAM, 32-64GB of storage, and a 4.5-inch 1080p screen. What you’re really after is the keyboard. It’s the same Blackberry keyboard of yesteryear, updated with a fingerprint sensor in the spacebar. This phone has been hovering around $500 for the last few months, which was far too much for a mid-range phone from 2017. Even for a keyboard fan, that was a tough sell. Today, Best Buy has dropped the price to $299.99 (unlocked with 64GB of storage). That makes the KEYone the cheapest way to get a Blackberry keyboard. 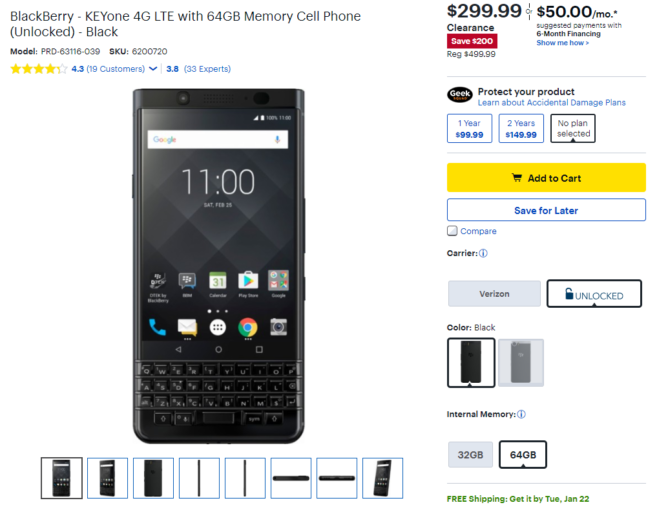 The KEY2 LE is $150 more, and the KEY2 is still full price. You probably won’t find this phone in many stores, but Best Buy will ship it to you.